I realize the blog has been quiet lately. Life has been overwhelming me. I just haven’t been able to wear all the “hats” lately. I haven’t gotten up for my early writing hour in about three weeks, and I’m a bit unmotivated to do the work of writing right now. The days speed by, and I go through the same motions, over and over again. I wish I could stop time. I wish I could keep my kids from growing up so quickly. Have you ever gotten tired of your same old life? I retreat into my books, where I can live a different life for a while, go somewhere else in my imagination. Or I retreat to the bathtub, where I let water get so hot that it burns a little, and I lay my head back and try to shut out all the worries. I went to see Peter Pan today, and I kinda felt like Peter: Why did I have to grow up and become so solemn and responsible? Yet the whimsy and the imagination of the story pierced my heart a little and let some happiness flow in. I’m getting to share such stories with my children, stories that will carry them into their future. Yesterday I read several Dr. Seuss books to Ephraim (Happy birthday to Dr. Seuss, BTW! 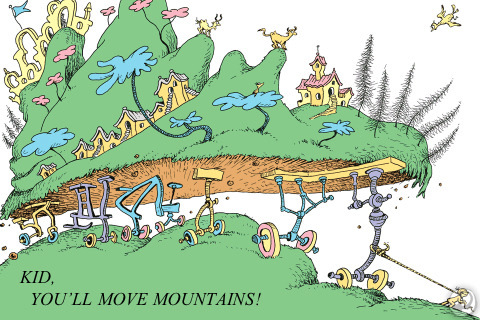 ), and a line from Oh, The Places You’ll Go kept coming back to me today: “Kid, you’ll move mountains!” And indeed, there is a picture of the kid hoisting a mountain on a set of wheels. Creative kid. I am definitely being challenged to keep up my one word for 2013 – PRESENT. I’m physically present for all the things that need to be done, but I haven’t mastered being emotionally and spiritually and mentally present all the time. I still am learning the art of just being. I wonder if in some mystical way you can be and go at the same time. If I could learn to be still in a place of deep wonder and belief, could I move forward into some different and more fulfilling kind of existence? Hmm . . . deep thoughts on the blog today.